Phase two of the Second Avenue subway line will expand the tracks to 125th Street and add three new stops in East Harlem. EAST HARLEM — With funding nearly set for the next phase of the Second Avenue subway line, El Barrio residents fear that the expansion will destroy local businesses. During the first phase of the project, which began in 2007 and stretches between 62nd and 96th streets, several businesses closed down because of the long-term construction. 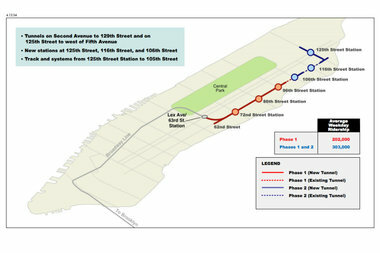 The second phase of the project will expand the Second Avenue line to 125th Street. Bates was one of about 30 residents at a public panel co-hosted by State Assemblyman Robert Rodriguez and the nonprofit Civitas Thursday evening at the Poet's Den Art Gallery on 108th Street. He and other panelists answered questions about funding for the project, safety during construction, and protecting small businesses affected by the expansion. He proposed providing grants and marketing support to the affected businesses and stressed the importance of securing them before the project begins. The Second Avenue subway line is expected to ease some of the stress from the overcrowded Lexington Avenue line, said Nick Sifuentes the Deputy Director of the Riders Alliance. Thursday’s panel came less than a week after the city and state reached an agreement on the MTA’s Capital Plan. Mayor Bill de Blasio and Governor Andrew Cuomo publicly debated how much each side should contribute to the plan. At one point, MTA chairman Thomas Prendergast said if the capital plan was not funded, projects like phase two of the Second Avenue Subway line would be the first to go. Although the city and state agreed on a plan, state legislatures still need to work out the details of funding the MTA during their legislative session in January, said State Assemblyman James Brennan.